Add A Touch of Fashioned Holiday Charm with Our Merry Christmas Wreath. Give friends and family a warm welcome at the front door with our Christmas Wreath. Ideal for hanging on walls, doors, fireplace, window or handrail of stairs. Our Christmas Wreath works throughout the season's holidays and will last for years. What Are You Waiting For? Just Get our Christmas Wreaths and welcome Christmas. 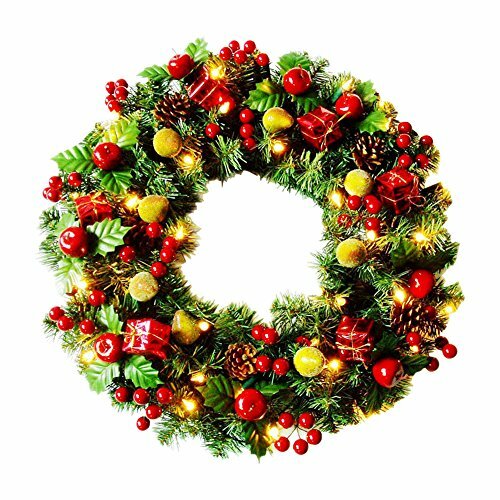 GREAT WREATHS DECOR OPTION: Entry door decorated with wreath is a great announce of your Christmas spirit. Christmas wreaths can actually be made out of just about anything. Our Christmas Wreaths can be a great option if you need a unique Christmas wreath. BUILT TO LAST: Our festive Christmas Wreath is made of a full wreath base with life-like artificial pine needles and lovely decorations of pine cones, red cherries, fruits and small red gifts. The wreath is finished with a lovely bow. It will add a touch of fashioned Holiday charm! BATTERY LED LIGHTS: This Christmas wreath comes with LED lights, put 3 AAA batteries (Not included) to light up the lights, greatly enhacing Christmas spirit. It makes a wonderful decor piece for a professional setting as well. RECOMMEND USES: It is ideal for hanging in an entryway, above a fireplace or in other rooms where you want to add a festive seasonal accent.